Princeton NJ -- Existing technologies could stop the escalation of global warming for 50 years and work on implementing them can begin immediately, according to an analysis by Princeton scientists. 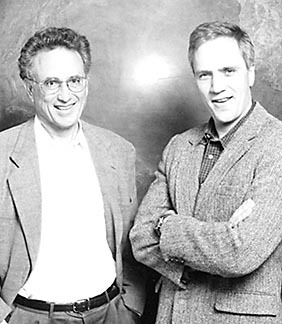 Professors Robert Socolow (left) and Stephen Pacala led the team of scientists that identified 15 existing technologies that could help solve the global warming problem. The scientists identified 15 technologies -- from wind, solar and nuclear energy to conservation techniques -- that are ripe for large-scale use and showed that each could solve a significant portion of the problem. Their analysis, published in the Aug. 13 issue of Science, indicates that many combinations of these 15 technologies could prevent global emissions of greenhouse gasses from rising for the next five decades. ''It certainly explodes the idea that we need to do research for a long time before getting started,'' said Pacala, a professor of ecology and evolutionary biology and co-director with Socolow of Princeton's Carbon Mitigation Initiative (see related story below). Although the current study did not examine the costs of scaling up each of the 15 possible technologies, the authors point out that implementing the measures would likely generate economic benefits, including creating new industries, reducing the U.S. dependence on foreign oil and lessening the need for other pollution-control expenses associated with burning coal and other fossil fuels. The study focuses on the main contributor to greenhouse warming, carbon dioxide, which comes from burning carbon-based fossil fuels such as oil, natural gas and coal. Throughout Earth's history, changes in carbon dioxide levels have been linked to changes in climate. Current global emissions of carbon dioxide contain 7 billion tons of carbon per year. That amount is projected to double to 14 billion tons per year over the next 50 years as the world population increases and people consume more energy. To keep emissions stable, technologies and conservation efforts would have to prevent 7 billion tons worth of emissions per year by 2054. Several of the options, for example, involve capturing carbon dioxide at power plants or other locations and storing it deep underground (carbon dioxide gas already is commonly injected into the Earth as part of some oil drilling operations). Others involve improving energy conservation faster than the modest improvements that are continually occurring. The researchers identify various renewable energy sources, including solar and wind, that could be scaled up faster than current projections. Changes in forestry and farming techniques also could lead to substantial reductions in carbon emissions. Pacala and Socolow caution that scientists must continue researching alternative sources of energy because new measures will be required after 50 years. By that time, some of the 15 technologies will have reached their full potential and may not be able to keep up with increasing demand. Pacala and Socolow said that limiting carbon emissions to present-day levels for 50 years would put the world on a track to stabilize the concentration of carbon dioxide in the atmosphere at about 500 parts per million. That would be roughly a doubling of the carbon dioxide content compared to the pre-industrial level of 280 parts per million. If emissions are left unchecked, it would be difficult to stabilize below a tripling. The current concentration is about 375 parts per million. A second reason for concern comes from current observations of change, including warming temperatures and the melting of ancient ice in glaciers, said Pacala. Lastly, the computer models that explain past climate behavior and predict future changes indicate that increasing the level of carbon dioxide will cause long-term warming. ''The models are not perfect but they are based on sound principles,'' Pacala said. ''You put it all together and you say, 'This looks dangerous.' And then when you find that we already have the technology to deal with it, we say, 'Why not?''' Pacala said. Pacala and Socolow's research is part of the Carbon Mitigation Initiative, a project in the Princeton Environmental Institute funded by $20 million in grants from BP and Ford Motor Co. The researchers are continuing their work with more detailed analysis of the challenges and opportunities associated with the technologies they identified and with further studies of the magnitude and urgency of the carbon and climate problem.